The show that is also a road trip. The StrategyCar podcast explores the big and small ways the web touches the world and the people in it. There's no telling where this mission will take us, but we can get there together. Let's call it a road trip. Michael Fienen and Aaron Hill are the hosts of the Drunken UX podcast, an "irreverent" show where they drink and talk about building and using things on the internet. This episode is a crossover episode. Laura Kalbag is the author of Accessibility for Everyone and actively works for social justice in the digital age. Here, Laura discusses the intersections between UX, accessibility, and human rights. Ben Callahan is the co-owner and president of Sparkbox, a web software studio with offices in Dayton and Pittsburgh. In this episode, Ben shares his philosophy around working together to "build right." 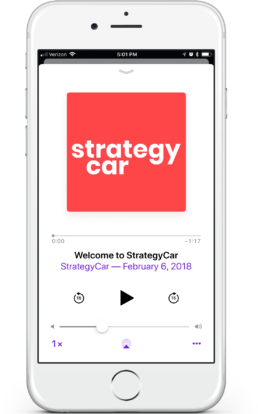 All episodes of StrategyCar are fully transcribed and archived.Settle in and enjoy the ride.